Besides Christmas, how often do you give someone a card? Amish have been known to send all types of cards, including sympathy cards, Christmas cards, and Valentine’s cards. That also leaves aside the practice of letter-writing, which flourishes in many Amish homes (and while on the subject, we can’t forget the clever way some Amish create envelopes). One happy occasion perfect for card-sending is the arrival of a baby. 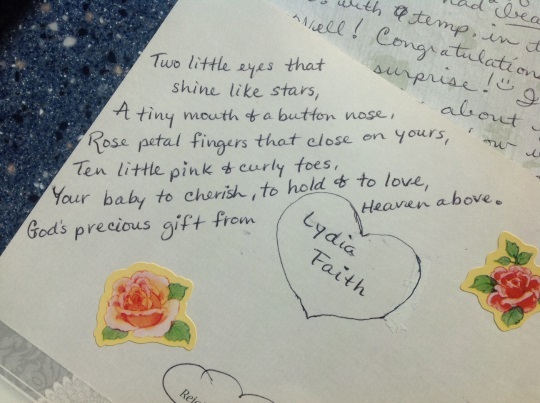 Our contributor ShipshewanaIndiana shares a card that just came following the birth of a daughter. This card was mailed by Amish friends in Arthur, Illinois. Unlike a lot of cards sent by the Amish, this one isn’t technically homemade. But with the added stickers and flourishes (not to mention “Train up a child” from Proverbs) I think it lands somewhere in-between handmade and store-bought. Oh, I love that card. 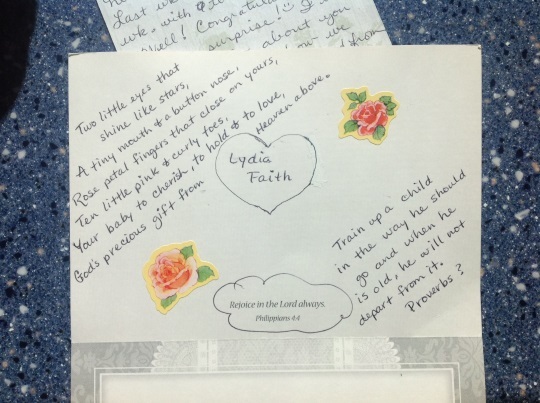 It is a beautiful way to announce Lydia Faith. Do Amish purchase gifts for the baby when they get cards like this? Amish ladies don’t have baby showers like us Englishers do, do they? Mark+ Holmes, I guess English people still send cards but maybe only the older diehards do. I know I haven’t sent a card is years. I even gave up Christmas cards. Most cards I receive are Ecards or a message on Facebook. A testament to our too busy lives and why families are becoming a thing of the past. I’ve been so happy to received a few cards from our Amish friends. One thing I’ve noticed, is that our little family simply uses non-lined index cards. One side is the address/postage side, the other is for the hand written note. Our Ruth draws a beautiful little vine or other flowers in one corner. The specifics are in the middle, there’s a verse at the bottom, and a footprint of baby on the other side. Lots of information and personal touches with these! I don’t know how she had time to make them, and wonder if ours was “fancier” than many of the others she sent out? There is also a difference from group to group. Like our group would send out printed wedding invitations, though some do make their own with rubber stamps, inks, cut outs or ribbons, etc., but some of the lower groups must handwrite the invitation. Some will just put it on an index card, some will use pretty note-paper. Some like the Swartzentrubers don’t send out invitations or birth announcements and also don’t make memorial or obituary leaflets to give out at a viewing. It must be really boring to get the mail when people don’t send cards or letters. I’m always disappointed if there is not at least one letter in the mail. Yesterday we got four and I enjoyed reading them after supper. This post and Mark’s comments are such a nice reminder. It has been a blessing, plus a little challenge to keep up with this as we have become members in a conservative Mennonite church. People find many opportunities to exchange little notes and homemade cards. It’s such a nice way to encourage ourselves and our children to remember our church family during the week, to sit down and do a simple card for someone. I admit I am extremely challenged in this area. Even before computers brought in instant communication, I was never very good. I even have finished cards in their addressed envelopes sitting around, waiting for postage from years ago! Now that our children are almost reading age, I am determined to make the mail a more interesting experience. Family Life, The Budget, and Nature Friend are all on my “want” list. And I am determined to revive Christmas cards this year! I send cards for most of the Holidays, baby bards, birthday, Sympathy, And sometimes just for no reason other than to say hello and let the person know I am thinking of them. I also love getting cards as well. I think sending cards and letters etc is really important, especially for celebrating the birth of a child – when they grow up, they have something to treasure from when they were born – like a keepsake, and you can’t do that in the same way with an e-mail or e-card! I am always buying note cards to say thank you to people for even the smallest thing and I enjoy adding my own touches inside with a drawing or miniature painting of something or other. I love to make my own cards using rubber stamps. I send them out to friends, relatives, and other members of our church for babies, birthdays, sympathy, and just about anything else I can find a reason for. The post office loves me. Congratulations to ShipshewanaIndiana on the birth of your daughter! Enjoy her! I am most apt to give cards for children’s birthdays, special adult birthdays like 40, 50, 60, or 90, special wedding anniversaries like 25 and 50, weddings, and babies. With cards at the Dollar store selling 2/$1, it’s easier to buy than making them. What a beautiful card. Who wouldn’t like to recieve a card like that? WHOA! I swear I know that handwriting! :-O Is the author of the card, by any chance, named Rachel…?? My Rachel writes the most beautiful letters and cards. She sends store-bought cards for Christmas and my birthday. The Christmas ones are always religious, of course, and sometimes she writes a Bible verse in the corner in addition to what was already printed on the card. Sometimes she includes a poem or quote on subjects like friendship. Although the cards are store-bought, they are not the $3 or $4 (or more) ones that you buy individually. They’re the kind you buy in a pack, so she personalizes them herself. She draws on them and puts pretty stickers on them (and the envelopes, too, sometimes). Her penmanship AMAZES me. Each correspondence is like a work of art. The letters are on regular lined notebook paper, but she goes over the margins, I assume so as not to waste space and therefore paper and money. She often makes little notes in the margins as afterthoughts/additions. Greetings of love in Jesus’ holy name! When we first started corresponding as adults, I really had no idea how to write a letter. I was used to emails and instant messaging. She has taught me the art, through example.